First to manufacture ‘the Mickey’ – liquor in a 12 ounce bottle, Perth native John McLaren made his fortune distilling alcohol. A Mickey is actually one of a series of uniquely Canadian alcohol measurements. “Two four” (a case of 24 beers), “twenty-sixer” (a 750 ml bottle of liquor) and “forty-pounder” (a 1.14 liter bottle of liquor) are all virtually unknown outside of Canada. 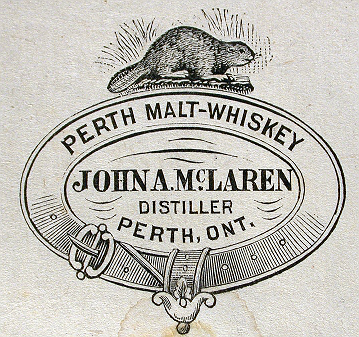 The very first ‘Mickey‘ was John McLaren’s “Old Perth Malt Whiskey”, a bottle could be had for .80 cents, and was hailed as being “equal to the best ever brewed in Scotland”. Most whiskies in those days were aged very briefly, usually four days or less, and McLaren aged his for a full month before it was distributed to the local bars and liquor stores around Lanark County. Robert McLaren, one of the earliest settlers, arrived in Perth in 1816. When his son John came of age, he sent him to Scotland so he could study the finer points of whiskey manufacturing. McLaren’s Distillery was founded in 1831, located on a section of land known today as Stewart Park. Some say it was the combination of the clear waters of the Tay River and the secrets learned from the Scots that led John to become the local ‘Whiskey King’ or ‘Baron of Booze’. photo: Henry Kehoe sitting in front of Spalding and Stewart Distillery in Perth. A favourite among whiskey judges, Old Perth Malt Whiskey enjoyed a unique reputation and even some doctors of the time regarded it as “non-injurious”. It became a household staple, said to cure everything from flat feet to the common cold. The popularity of McLaren’s whiskey grew in leaps and bounds, and in its heyday was sold from coast to coast, all across Canada. John laboured day and night, expanding his operations, and became the town’s wealthiest businessman. Some say he was secretive, reserved, and was not one to discuss his personal or business matters. Photo above: J.A. McLaren Distillery – located behind the town hall in present-day Stewart Park. He never married, had no children, and for the most part lived a quiet life and kept to himself. When John McLaren passed away at the turn of the century, many in the town of Perth began to speculate – who would be the heir or heirs to his fortune? By 1902 the town of Perth was “never more absorbed in one topic of conversation” as they were during the trial held in the local courtroom to settle the case of John McLaren’s Will. Frank Walker, long-time employee swore that John McLaren had confided in him about his childhood and they shared a special relationship. John A. Stewart, McLaren’s nephew, well-known Perth lawyer, and respected member of parliament, claimed that he drafted a will for Mr. McLaren in 1897, witnessed his signature on the document, and that his uncle had left everything to him. stuffed down the front of her dress !!! 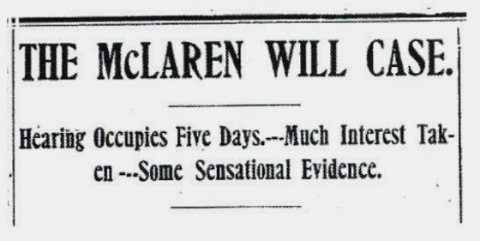 Did Minnie Hamilton inherit McLaren’s millions? Who inherited the money from the Whiskey King? “The year 1896 was a good period for the hotel industry in Perth. Five recorded hotels flourished within the town boasting a grand total of 165 rooms, and five bars. According to 19th century observers, Perth had a high caliber of service, and had an excellent reputation as a fine hotel town. One such observer was the old Perth Expositor which noted how strangers “always judge a town by its hotels” and then carried the impression of hospitality and service to the far reaches of the land. The hotel business of 1898 was a vast improvement over the rude taverns and inns of early days. Several of the hotels survived the turn of the century and can be readily seen in today’s busy commercial trade. The only hotel still bearing the same name and remaining in the same location is the Revere House at Wilson and Foster. The hotels of Perth began just prior to the Boer War, and were five: Barrie’s Hotel, Hicks House, Allen House, Revere House and Queen’s Hotel. They were all located in the business section of down town Perth and catered to a through trade from road, stage and traveling salesmen. Since 1900 the road trade has shifted west to Highway 7 where an assortment of motels enjoy a lucrative business from an almost entirely auto trade. In 1896 the oldest hotel was Barrie’s operated by Thomas Barrie. It had thirty rooms and a well stocked bar. A resort of the surrounding farming community, the hotel enjoyed a heavy seasonal business. Mr. Barrie was hailed as a “jolly good natured fellow” with a “pleasant greeting” for all. The Hicks House, now the Perth Hotel, was hailed as the “leading commercial hotel” in eastern Ontario, sporting a bar, billiard room, free bus rides and a variety of fare on the table. The proprietor was John Wilson, noted for his catering and disciplining of the “hotel attaches”. The Queen’s occupied thirty rooms, a bar, a billiard room and stables across from what is now Girdwoods Store on Foster Street. Owned by Frank A. Lambert, father of Edward Lambert, present day proprietor of the Imperial Hotel on Wilson, the Queen’s closed its quarters in 1918 after purchasing Barrie’s from James P. Hogan who succeeded Mr. Barrie as operator. Queen’s and Barrie’s are thus the modern day Imperial Hotel operated by Ed Lambert who took over from his father in 1934. In 1896 Revere House was a 25 room establishment run by W.J. Flett who is described as one of the best hotel men in the valley. He enjoyed a popular local trace. Largest hotel in Perth, now closed to business, was a fifty room spread called the Allan House, situated to the west of the town hall in a block now occupied by Chaplin and Code and the Coin Wash. Andrew Robinson the proprietor, was famous for his “uniform courtesy and kindness” and the free bus rides to the train and stages. Mr. Robinson purchased the Allan House from I.C. Grant after ten years as an employee of the Hicks House. 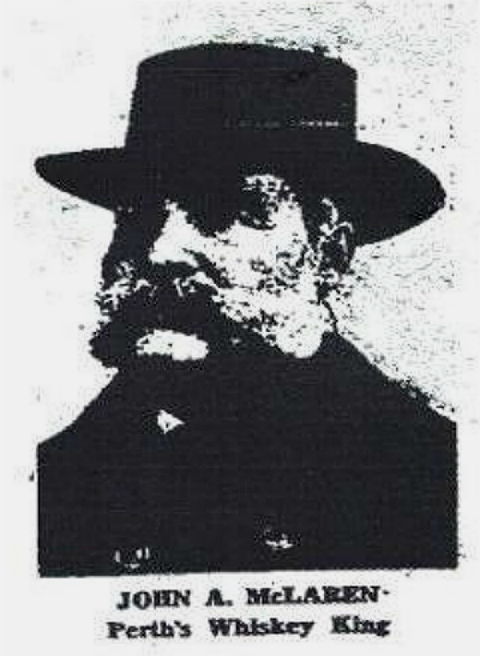 John McLaren was listed in the 1881-82 Business Directory for Perth, Ontario. Do you recognize any of the local names of business owners? CONNOLLY, Edward; Captain Tay Steam Fire Co.
DRYSDALE, Jennie, Miss; Telegraph operator G. N. W. Telegraph Co.
HALLIDAY, Wm. ; (Scott & Halliday) General Merchants. McLAREN, John Morris; Proprietor Revere House…. RADENHURST, William H.; (Radenhurst & Shaw barristers and solicitors). Did one of these Business Owners in Perth inherit McLaren’s money? Someone in Perth got McLaren’s millions! To discover more about the curious case of John McLaren’s will, and the trial that had the whole town of Perth talking, read the story “Jessie’s Gift”, from the book “Lanark County Connections – Memories Among the Maples”. This entry was posted in Historical Interest and tagged algonquin college resource library perth ontario, Archives Lanark, Arlene Stafford-Wilson, hotels in perth ontario history, john mclaren distillery perth ontario, john mclaren whiskey lanark county, john mclaren whiskey perth ontario, lanark county ancestors, lanark county connections memories among the maples, Lanark County Genealogical Society, Lanark County genealogy, lanark county history distilleries whiskey, lanark county tourism history whiskey distilleries, McLaren's Distillery Stewart Park, McLaren's Distillery Stewart Park Perth Ontario Lanark County, Old Perth Malt Whiskey Perth Ontario Lanark County, perth courier perth ontario, perth ontario business directory 1881, scandal perth ontario, small batch whiskey perth ontario, small still whiskey perth ontario, The Book Nook, the international writer's festival perth chapter, trial of john mclaren's will perth ontario 1902. Loved the article and the history. I actually have in possession two bottles of the 1878 distilled 25 year. I have tasted it and really a whisky that takes you back in time!